As promised, the Games for Windows Marketplace has relaunched and although it's definitely better, it's still not very good. 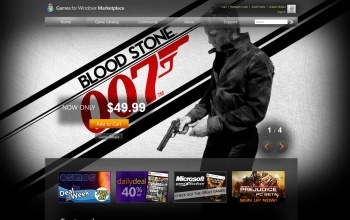 Microsoft announced in October that as part of its effort to Take PC Gaming Seriously, it would relaunch the Games for Windows Marketplace as a web-based application, with improved performance and search capabilities, support for purchases with credit cards or Microsoft points and even non-Live games for sale. That big day is now at hand; the all-new GfW Marketplace is up and running, and we can finally see for ourselves what Microsoft hath wrought. It certainly looks better, with a big, easy-to-use interface. The game catalog can be broken down into categories like New Releases, Top Downloads and Live Enabled, while Weekly and Daily deals are highlighted at the top of the game list. Everything seems to work pretty much like it's supposed to, but there are still an awful lot of shortcomings. The first thing you'll notice is that the library of games remains small, particularly when compared to certain other digital distribution platforms that will go unnamed, like Steam. The "new releases" category includes only 007: Blood Stone, LEGO Universe, the free Game Pack 011 for the Game Room and six DLC packs for Dead Rising 2. System requirements are missing or woefully incomplete for most games, while browsing the catalog is a hassle because after you look at a game's detail page, there's no way to return to where you left off; the catalog view automatically resets to the start of the default "featured games" list. Pricing is also a mess. Fallout 3 is listed at 50 bucks while the DLC expansions go for ten bucks each; there's no sign of the Game of the Year edition, which includes all the DLC, anywhere. The excellent but aging Batman: Arkham Asylum carries a price of $49.99, while the Game of the Year edition is $39.99 - and yes, that's regular price. Why? It's impossible to say; the game detail pages for both versions are identical, except the Game of the Year edition is called "AA GOTY" while the standard release lists the various sold-separately DLC. Section 8, the decidedly-average onilne FPS, goes for 50 bucks. So does Vancouver 2010, the official game of the most recent Winter Olympics, which is currently packing a Metacritic rating of 57. The list goes on. It's hard to avoid concluding that despite the promises, the Games for Windows Marketplace is little more than a new coat of paint on the same old mess. But why? Relaunch or not, this is no longer a new platform in any sense of the word, and it would be silly to give Microsoft a pass for not being able to bring the same resources to bear as a company like, say, Valve. It's possible that the kinks will eventually be ironed out and that the GfW Marketplace will one day become a viable, relevant distribution platform. But making big promises and then coming up with something like this is not a good way to go about convincing people that you're serious about their platform.